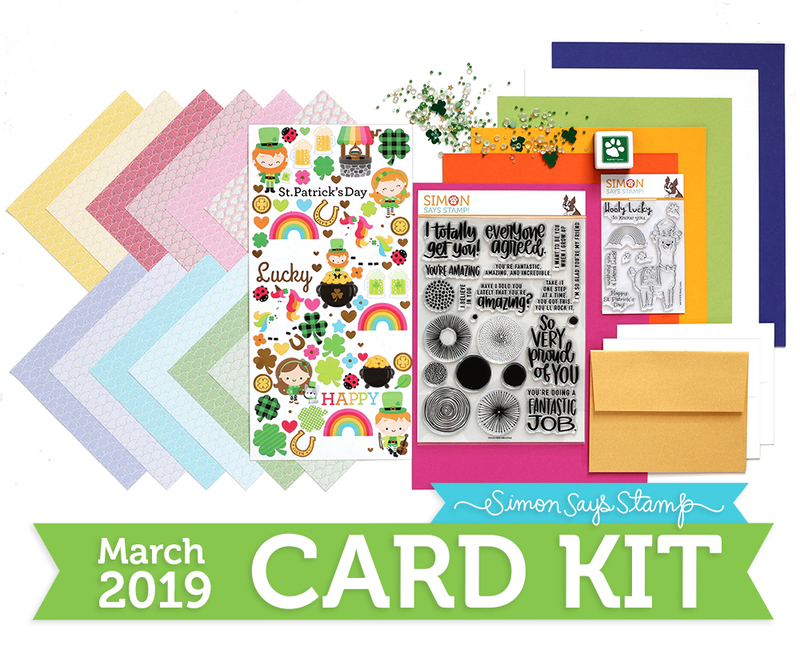 My Card Kit arrived and the first thing I did was to make a set of St. Patrick's Day cards for our Grands. They are small - 1/2 of an A2 size, measuring 2 3/4 X 4 1/4". 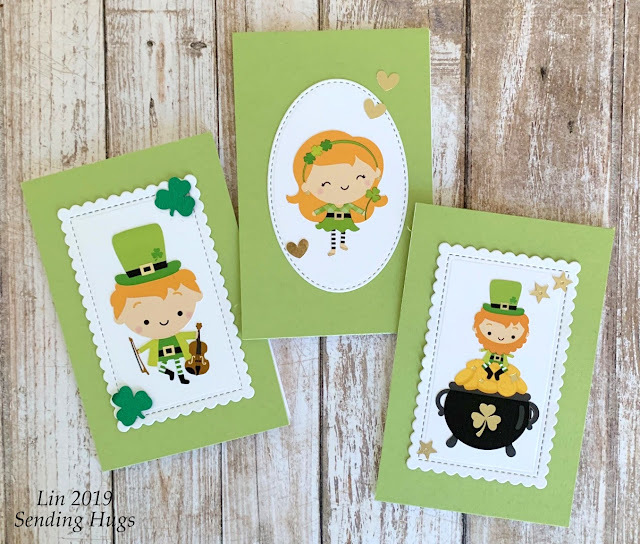 On the inside of each card, I stamped the tiny "Happy St Patrick's Day" sentiment from the smaller stamp set in the green ink and added one of the shamrock stickers. As always at this time of the month, our theme is Anything Goes, and this week the team is showcasing Pink & Main goodies. Since we're still in the month for Valentines, I thought I'd use my new die to make a quilt for the occasion. If you look closely, you can see that there is stitching around each of the inlaid pieces in the quilt. Doodlebug's tiny prints are the perfect choice for piecing this paper quilt! 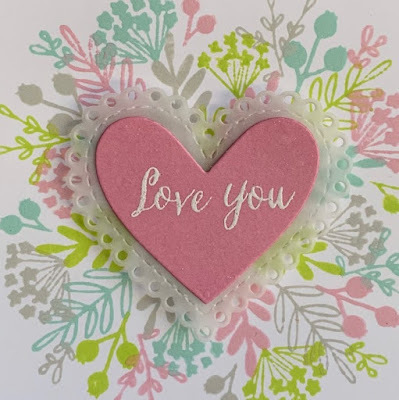 I added a popped-up heart to the center, and a sentiment made from 2 different stamps. 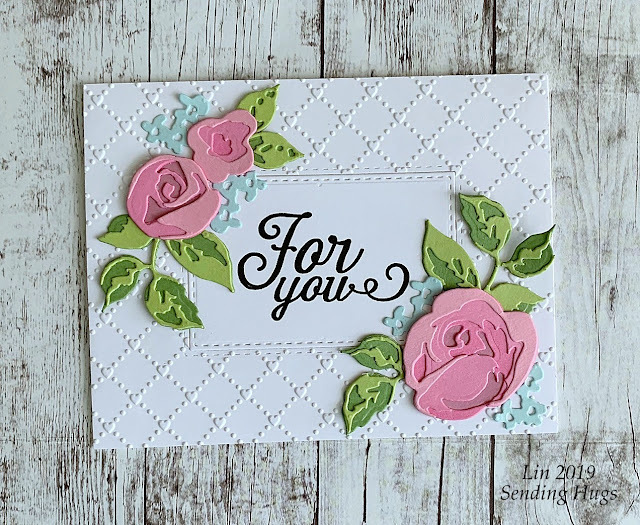 I have another card using the Rose Flurries dies and a die/embossing technique that I've used before. I trimmed a panel of A2 white card, cut out the inner stitched rectangle, then embossed the "frame" that was left before inserting the stitched rectangle back into it. Then I stamped my sentiment and glued down the florals. 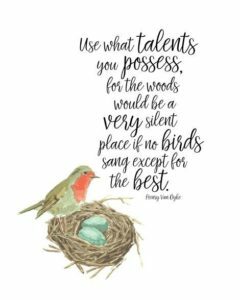 This sentiment will work for so many occasions; it's a good one to have on hand! 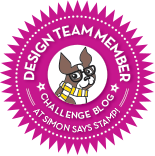 I've noticed the embossing design as a die and in patterned paper pads. I love the little tiny hearts! 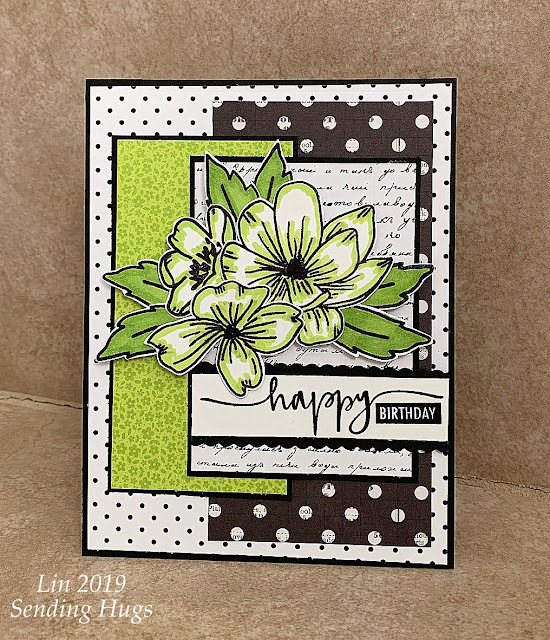 Here's a card using another couple of Tammy Tutterow dies from Crafter's Edge. 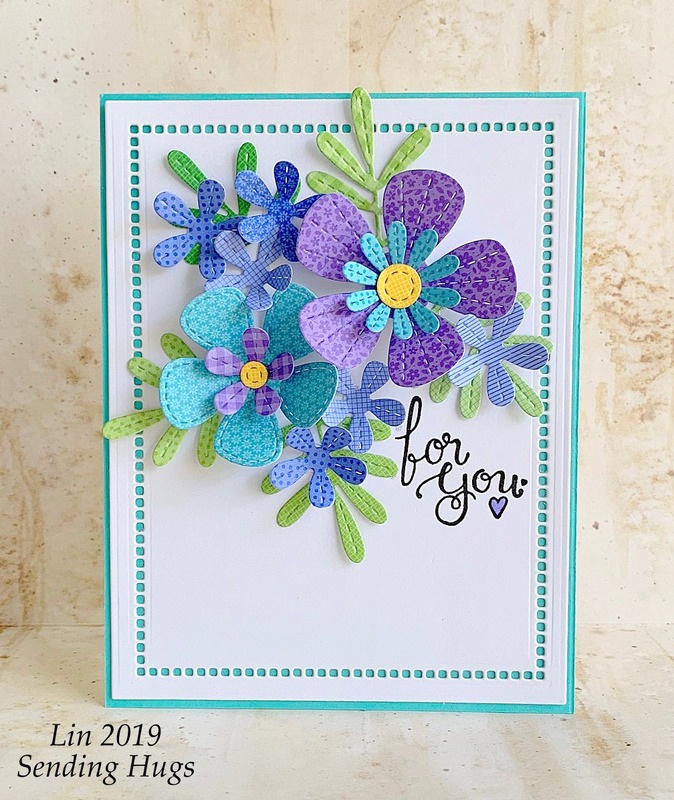 The flower is actually a set of dies called Beautiful Succulents 3, but don't they make a pretty flower, too? I cut 2 of each of the middle-sized and 1 of the smallest dies, then separated the layers with adhesive foam squares and fluffed the petals. I added a die-cut black circle as the center. 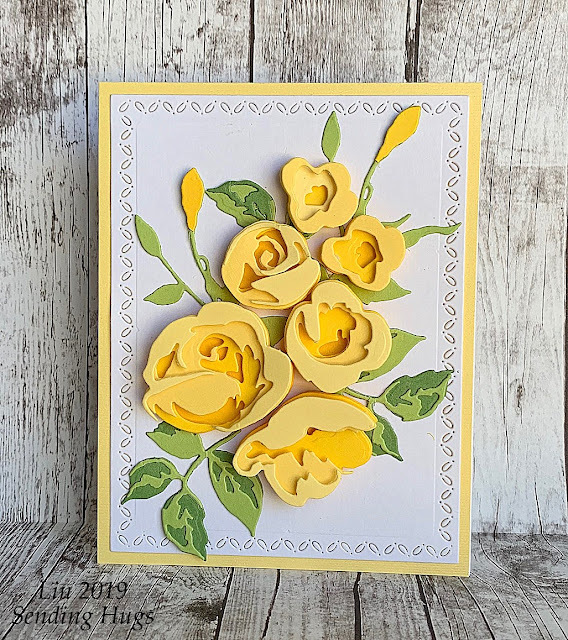 I enjoyed working with last week's yellow flowers, so I used the same cardstock and switched up the floral dies for this card, this time building up the layers from light to dark. As in my last card, I separated my layers on the large flowers with adhesive foam. I also used 3 of the Hemstitch dies on my background panel - still in love with this set! 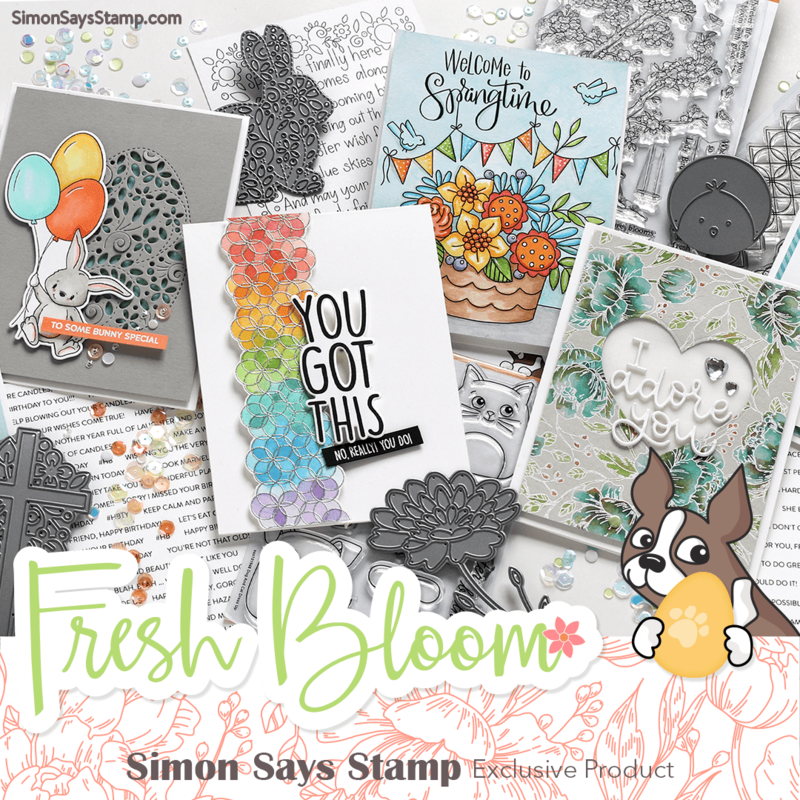 Our theme this week is No Stamps Allowed, and my teammates and I are showcasing Simon Says Stamp exclusives. 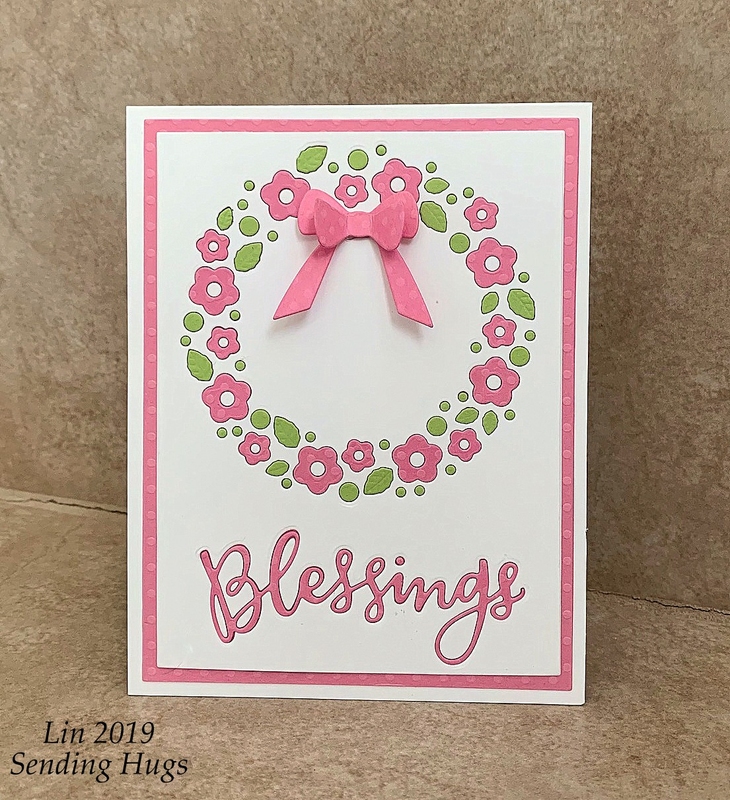 Here's my card for this week - a wreath for spring! My design is pretty simple. I inlaid the wreath and sentiment dies into a white panel, then added a bow and some framing. 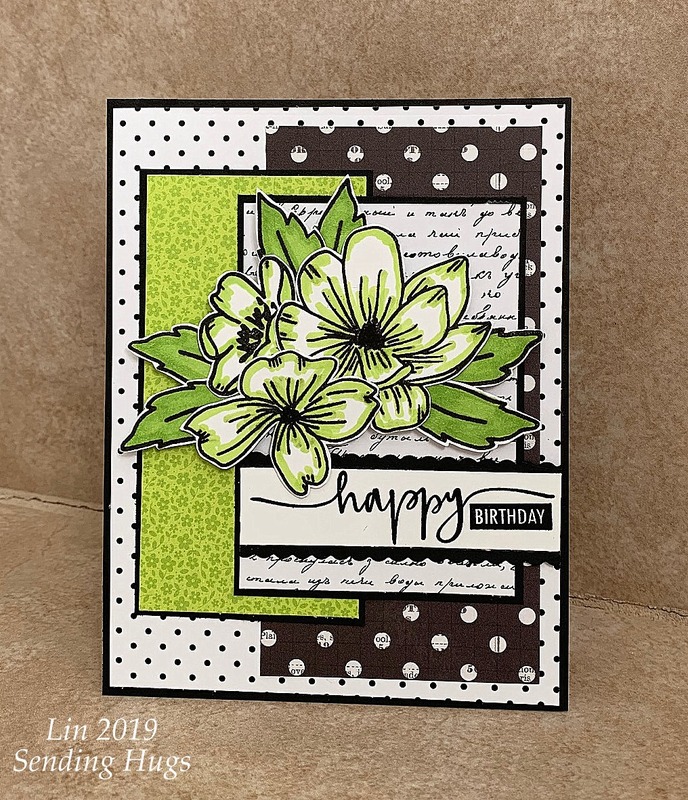 I have a CASE of one of my old cards today, using different supplies but keeping the same layout and elements. I've always thought florals and stripes make a pretty combination. 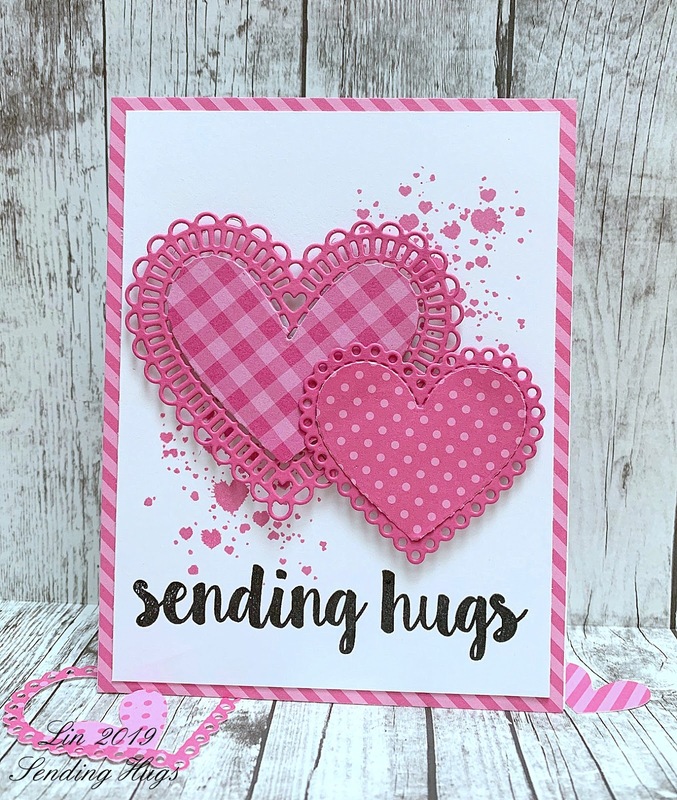 I must be in my "pink stage" - I'll see you again tomorrow with another pink card! Here's another play with Concord & 9th's Everyday Bouquet Turnabout stamps. 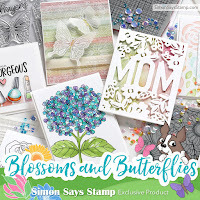 The delicate details of the stamps look nice in pastels, I think. 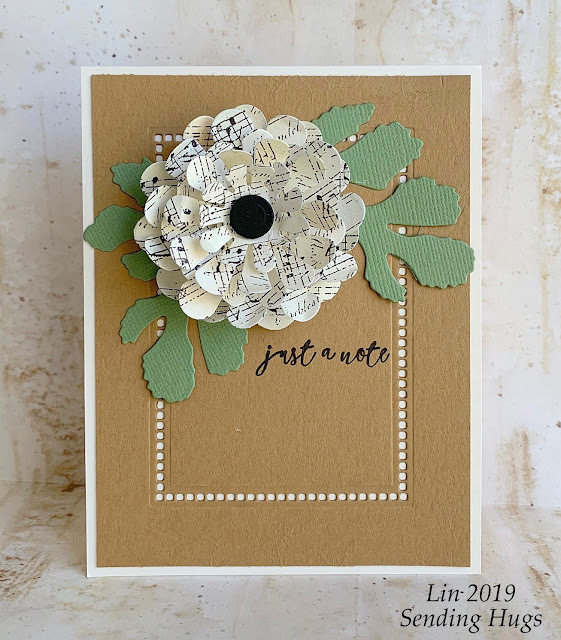 After I'd chosen my ink colors and stamped the design, I tried to find some cardstock to match them. I really wanted to bring in the grey, but nothing was right until I tried using vellum, and that worked for me. Here's a closer shot for you to see better. I also like that the details of the vellum heart pick up on the hemstitched border, and how it adds a frilly look without detracting from the stamped design. I tried my hardest to resist, but in the end I caved and got myself the Concord & 9th Everyday Bouquet Turnabout kit. 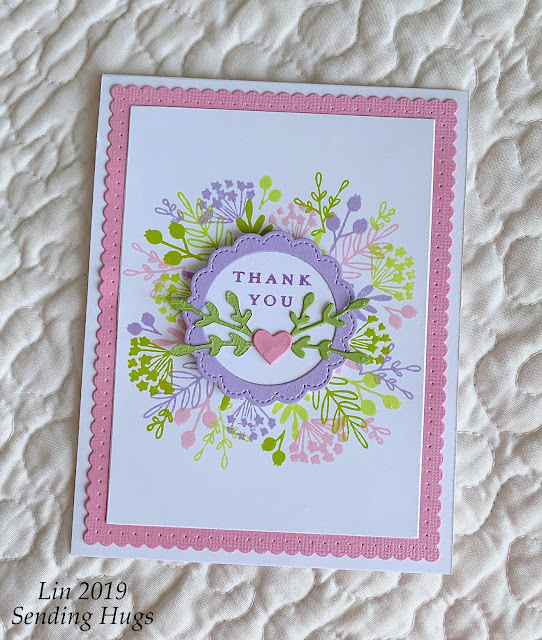 I stamped the bouquet out 4 times to try different color combinations, and I'm sharing 2 Thank You cards today. First up, a feminine version. 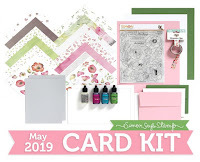 I bought this kit mainly for the dainty images in this stamp set, but to have some dies to go along with them, plus the jig to align everything included in the kit was a win-win! Here's another using distress oxide inks and one of the dies; it may be a good option for sending to a guy. 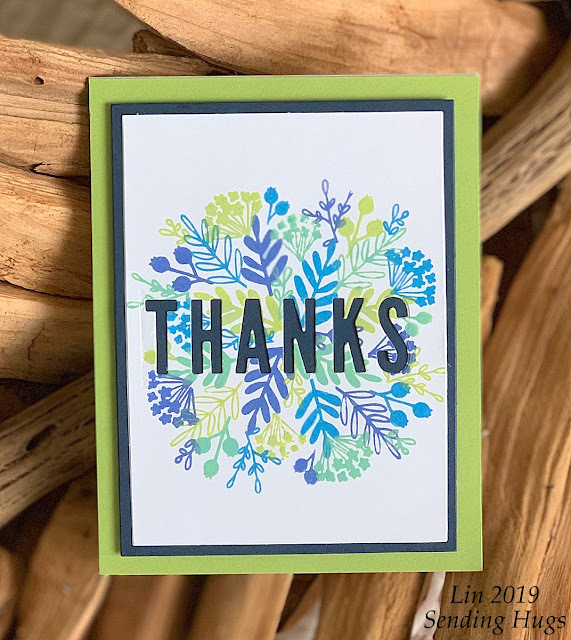 After stamping my bouquet, I used the thanks die included in this set to cut out my sentiment, then trimmed the panel and lined it with first navy and and then green. Since I had my Rose Flurries out last week, I decided to play some more with them. Unlike most of the cards I've made before with these, I popped up all of the layers, so this is really dimensional! I put the darkest shade on the bottom layer and lightened each succeeding layer. After moving them around to find a pleasing arrangement I glued them down to a panel of white with a tiny stitched border, and then framed that with the lightest of the yellows. 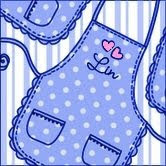 I decided against a sentiment for now - a tiny banner can easily be inserted when I need it. This design would work for so many occasions - birthdays, thinking of you, an anniversary, maybe even a wedding. Our challenge this week is to make something using black, white, and one other color of your choice! The team is playing with Avery Elle products. Way back when there was a weekly challenge called the Play Date Cafe and my favorite challenges there were called "Black, White, and a Splash". I always loved the ones that asked for a splash of lime - I think all the colors pop in that combination. So of course, that was my first choice for this week's card. That was so much fun that I used the same elements and made a 2nd card, this time with yellow. This time I used the largest and the smallest of the flowers and a sketch that I've used many times. 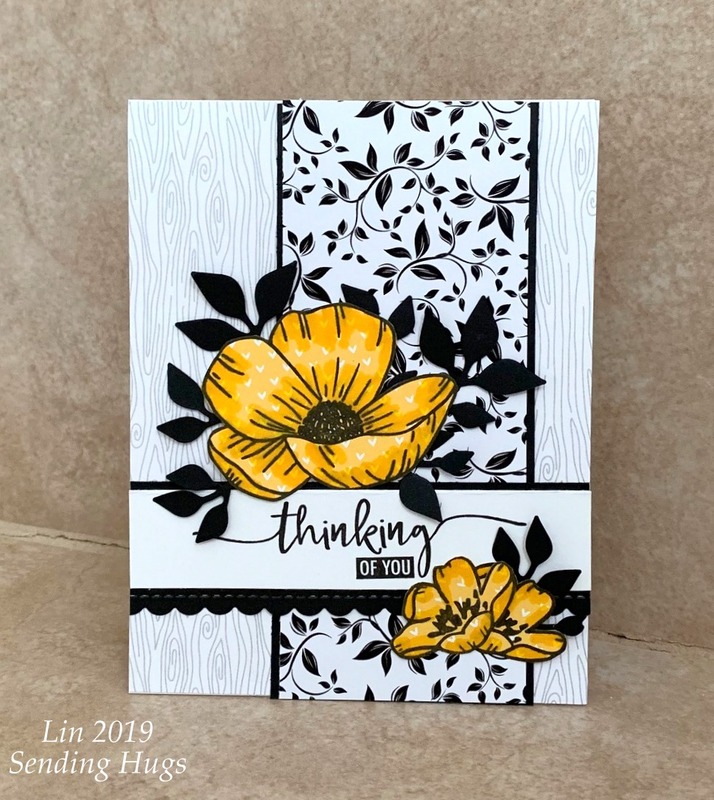 I was lazy this time and stamped my flowers on a yellow heart print design paper, adding a tiny bit of shading with a marker. And I used die-cut leaves to mimic the vining design in the paper. 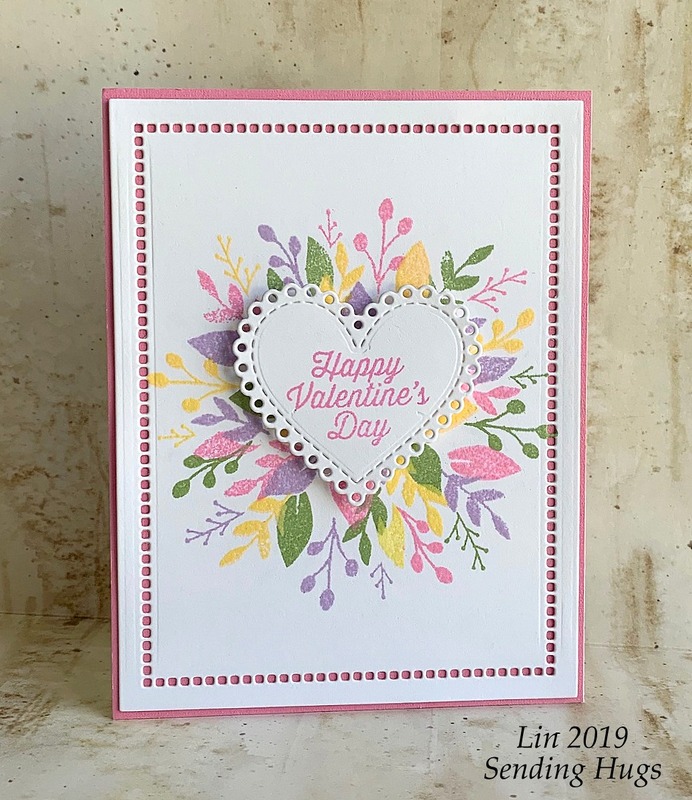 Here's a card that I made for Valentine's Day. 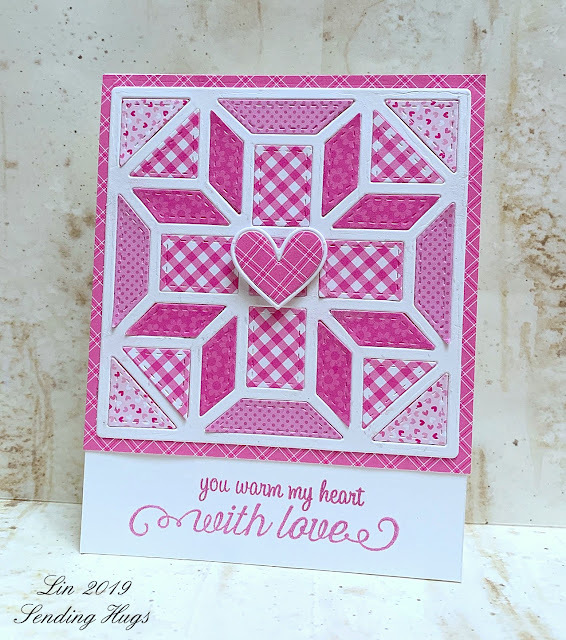 I cut the Heart doilies from patterned and solid paper, then pieced the gingham and dots back onto the solid. 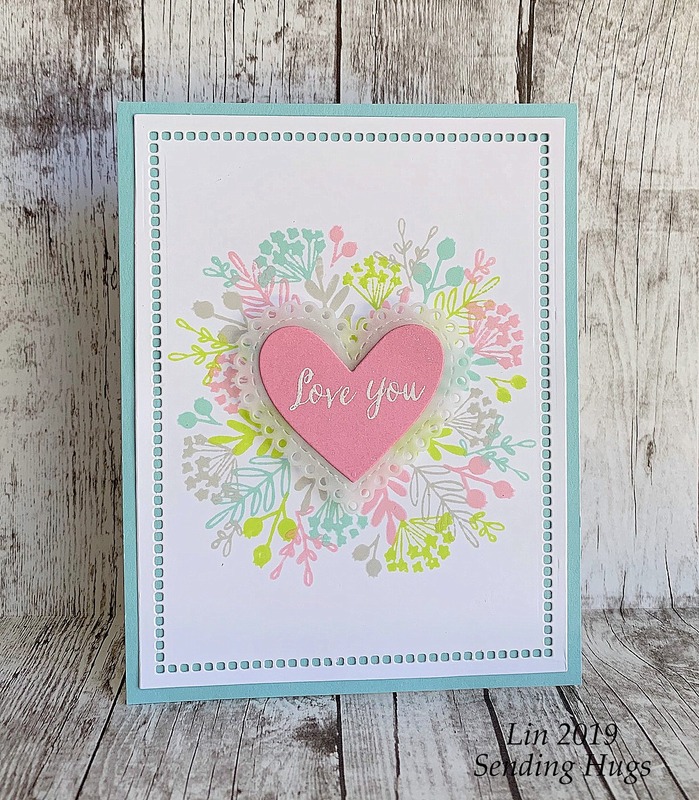 I love these little heart splatters - they are just the right size to work with everything! This card resulted from a conversation with my friend about whether or not the Hemstitch dies were large enough to thread ribbon or floss through. I can verify that floss is a big yes - we'll reserve judgement on ribbon until I can try that another time. I die-cut a medium Hemstitch rectangle from a slightly smaller than A2 size card panel, after having made certain that my stamped sentiment would fit inside. 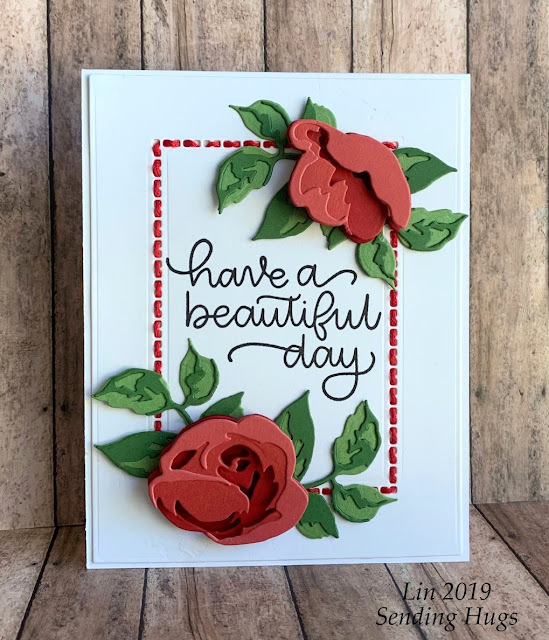 After stamping it, I did my stitching, securing the floss ends inside with a piece of tape, then constructed my Rose Flurries flowers and leaves, popping up a couple of the flower layers, and arranged them around the sentiment. I was also trying to decide if I really "need" the new Garden Picks dies, since I already own these Rose Flurries dies. For now (and I may eat my words) I think I'm content with what I have. 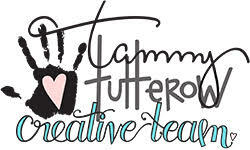 Here's another creation using some of Tammy Tutterow's dies from Crafter's Edge. 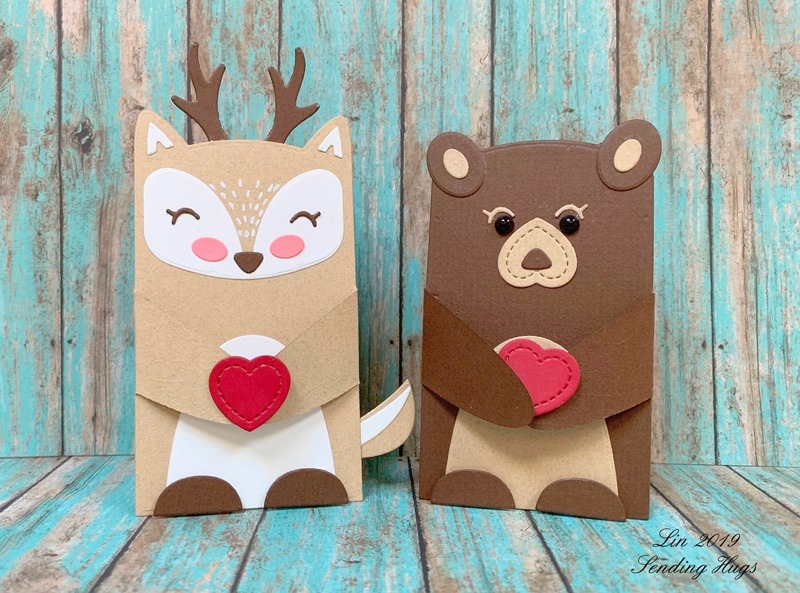 The Basket die set cuts several pieces so that you can weave your basket. I die-cut the pieces from kraft and then sponged each of the edges with distress ink to make them show up a bit better. There are 2 long handles on this basket - for this card they provided a base to attach my flowers, so you don't see much of them. The little tag and heart are also part of this die set. 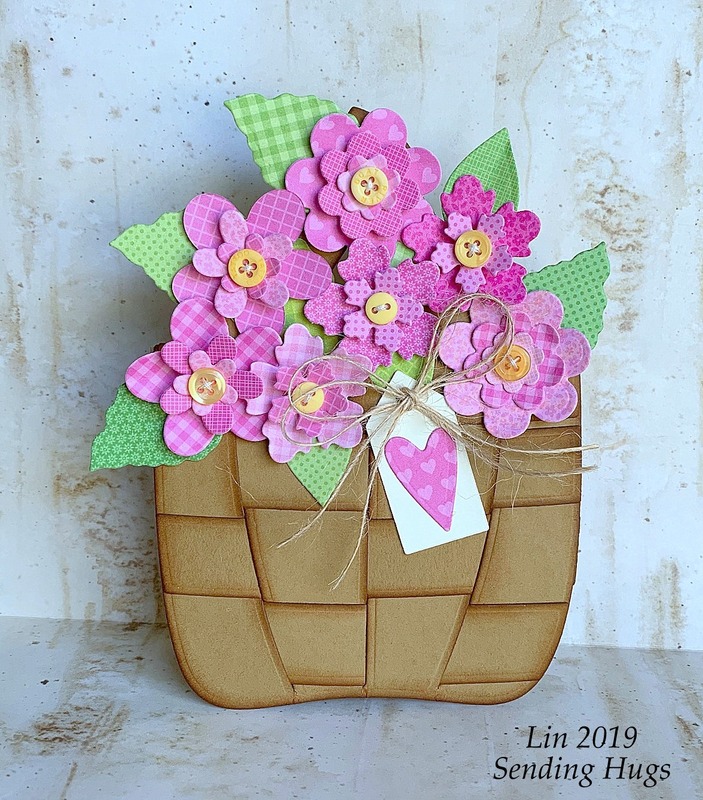 I made this into a card by attaching a traced basket shape to the back of my woven basket, scoring the back about 3/4" down from the top and then gluing that section only to the back of my woven basket. 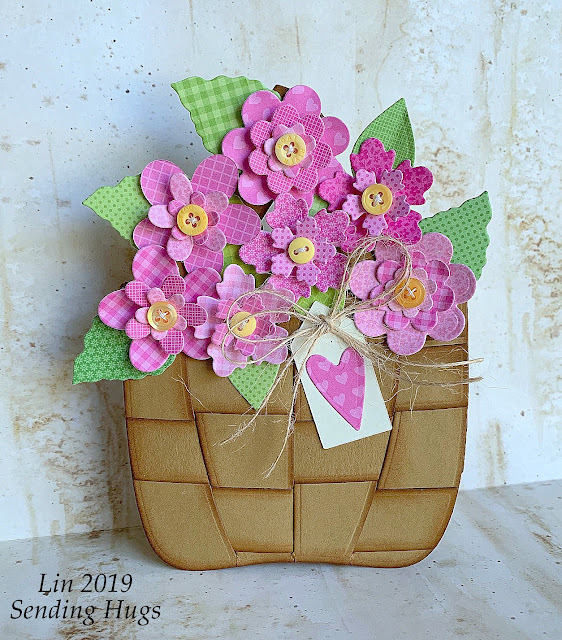 I filled my basket with some 2- and 3-layer die-cut flowers, mixing up the tiny patterns, and adding little yellow buttons into their centers. 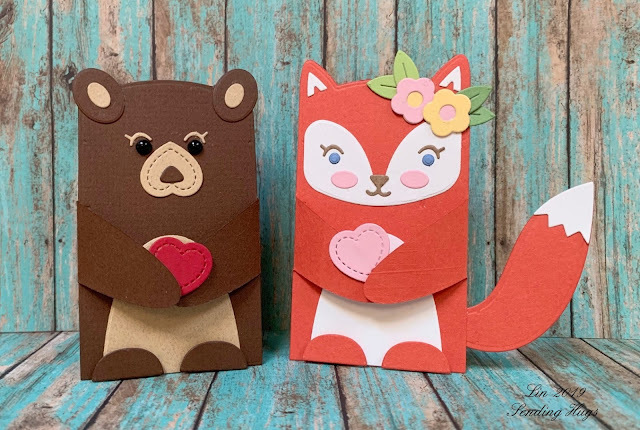 The finished card measures about 4 1/4" wide by 5 3/4" tall, so it will need its own envelope. But if you bring the flowers down more over the basket, I think you could adjust this design to fit into an A2 envelope. 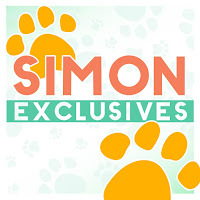 What a fun project this was to pull together! These dies are designed primarily for use with fabric or felt, but as you can see, they translate nicely for paper, too. Thanks for stopping by today. 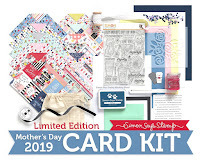 Another die set I've had on my wishlist forever is the Stitched Blooms set. I finally treated myself and here is my first play with them. 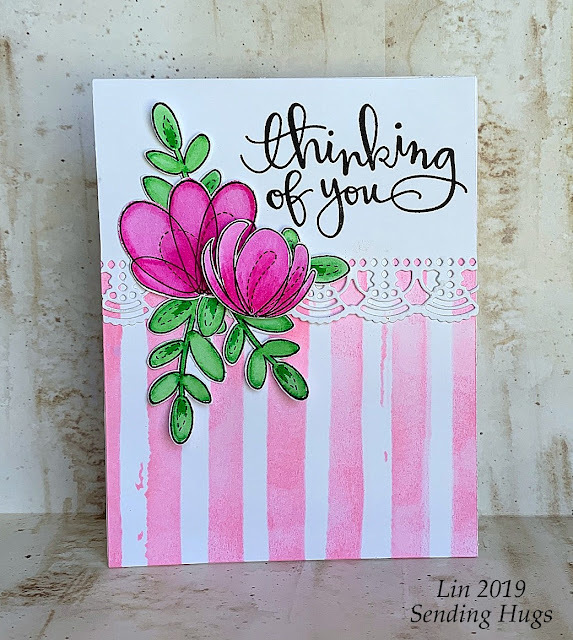 I used some tiny print Doodlebug papers; I love the vibrancy of these colors! 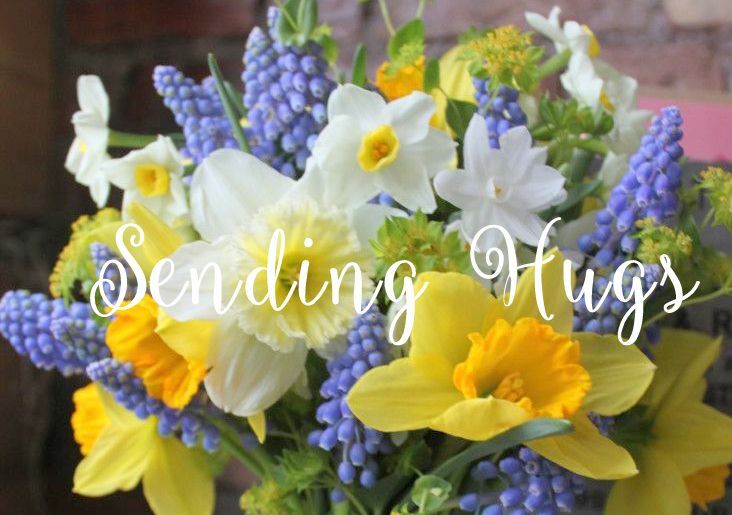 Thanks for dropping by - have a good one! 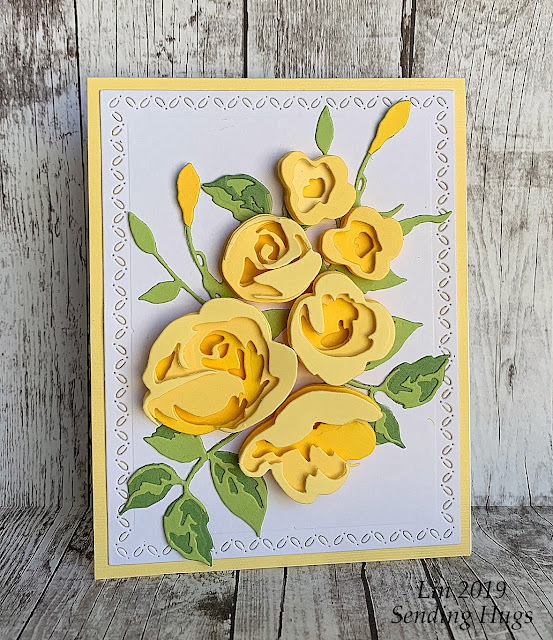 I've been honored to receive a surprise once a month lately from Spellbinders - this month I got the Large Die of the Month, and had a ball with it! 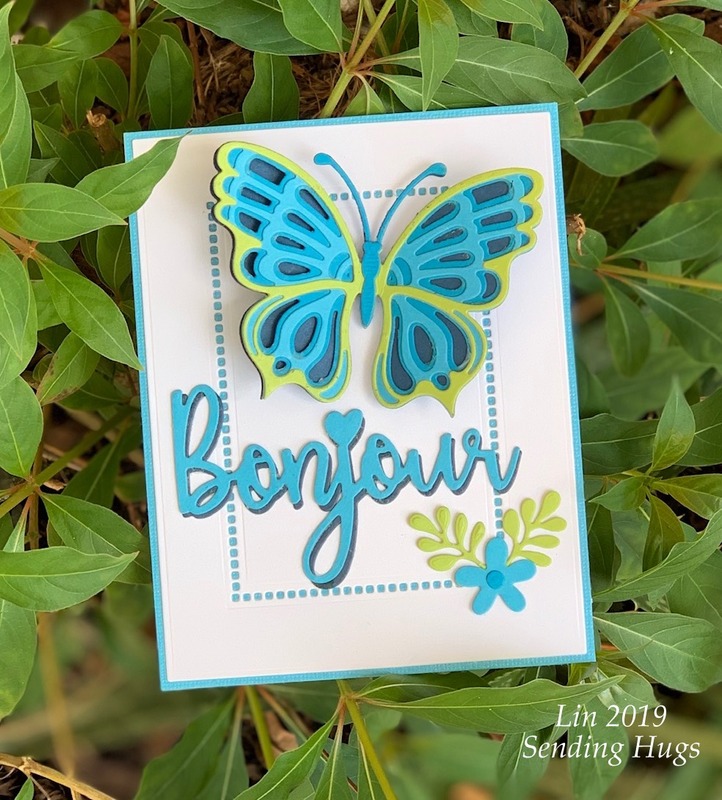 The butterfly is made of 4 different dies, all designed to work together. 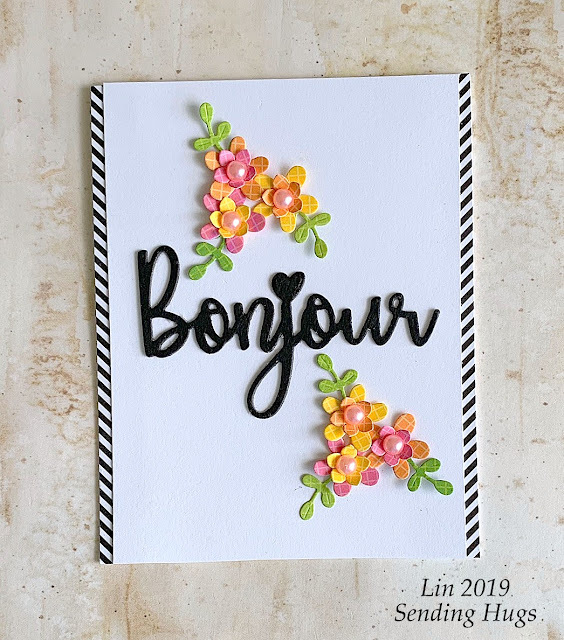 The set also includes lots of different flowers and leaves and the Bonjour sentiment you see here! 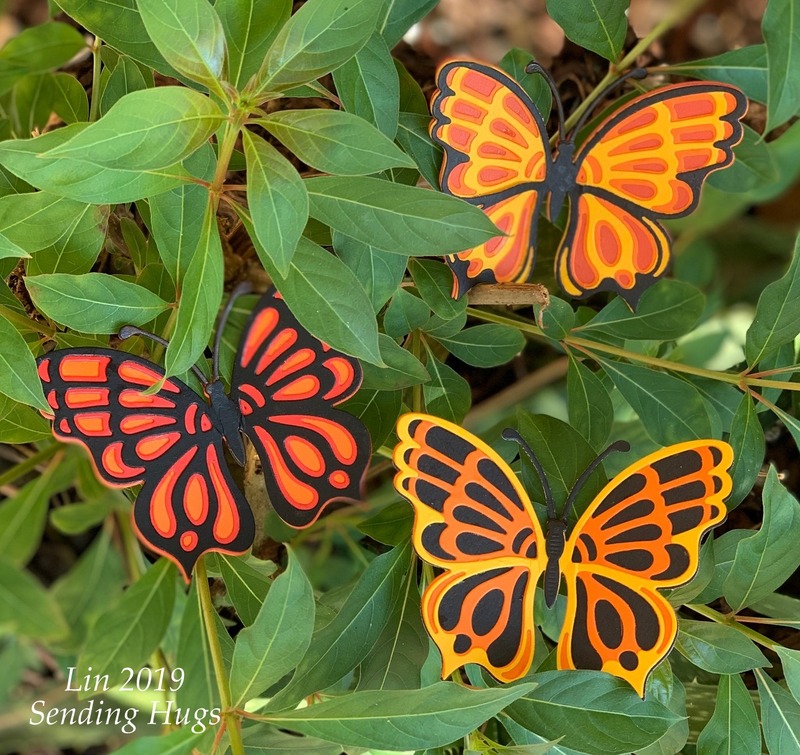 Here's just the butterfly in a warmer color scheme. Every butterfly needs a Flower Garden! 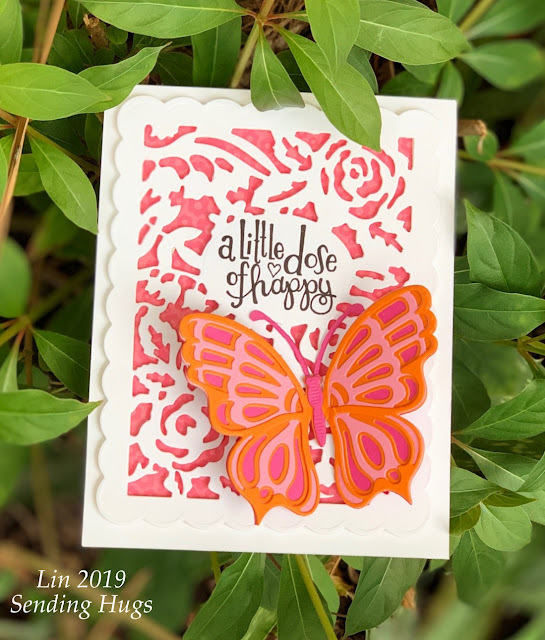 I used orange and 2 shades of pink on this one, and a subtle coral print underneath the cover die. Next I brought back the big sentiment and added some of the little flowers. These colorful flowers have a little mesh design in them, just enough not to overpower their diminutive size. The sentiment was cut twice and layered. When these dies first arrived, I tried some different color combinations; here's a shot of them. From the top, I used all 4 of the layers, then skipped the top layer in the middle, and at the bottom, skipped one of the middle layers. As you can see, no matter how many layers you put together, they all turn out nice. 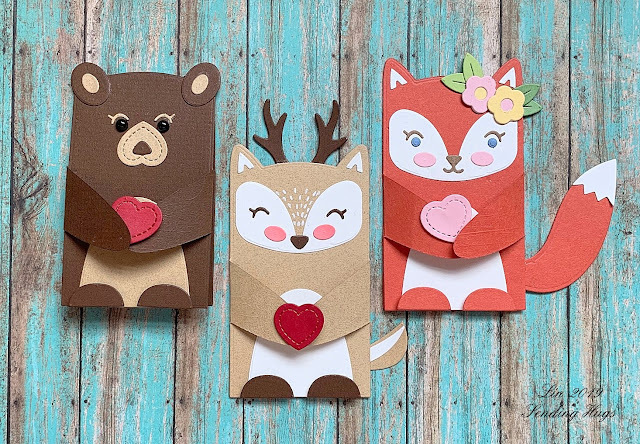 Wouldn't it be fun to make a variety of these in different colors and make a mobile? They are symmetrical, so you can cover the reverse in any or all of those layers, too, and with all the layers, they are really sturdy! You can see everything in the set HERE, plus more ideas to use it. 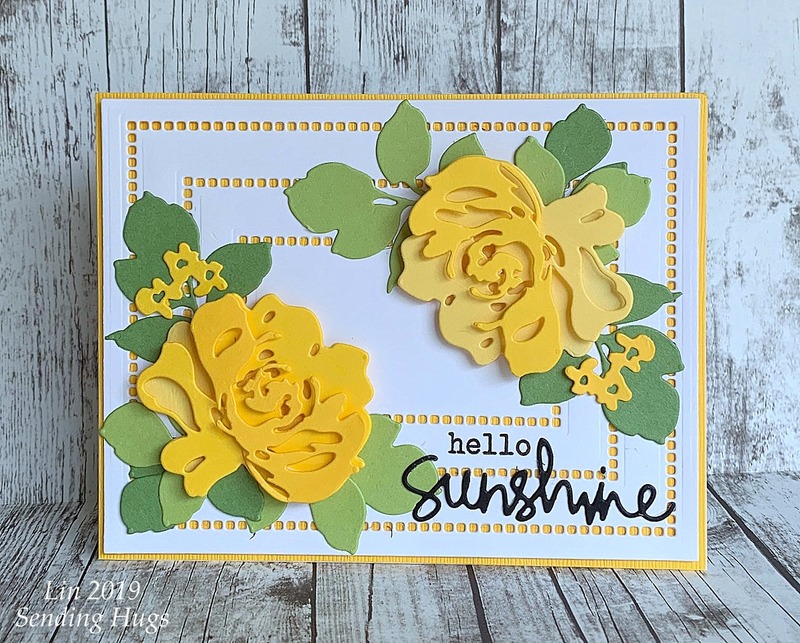 Thank you, Team Spellbinders, for allowing me to play with this month's fun set! I have wanted this Hemstitch die for quite awhile, and finally was able to snag one - it does NOT disappoint - love the sweet effect it gives!